ISON Update for 22:00 UTC Nov. 28. 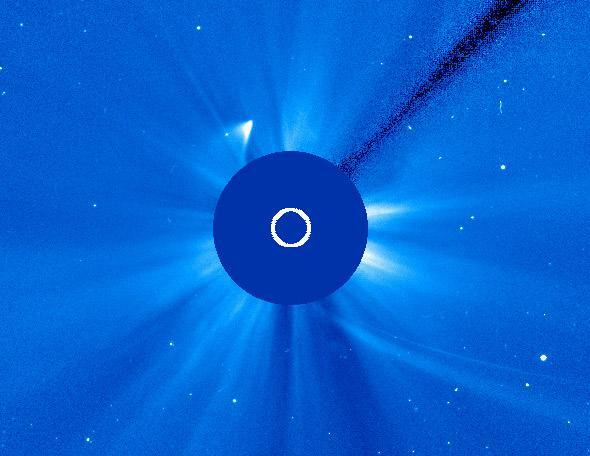 Comet ISON, or what’s left of it, returning to view in the wide-field LASCO C3 camera on SOHO. 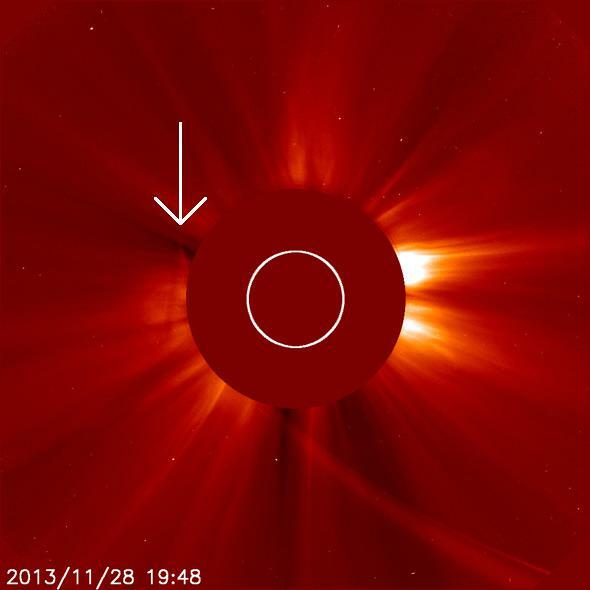 Well, well, well: ISON lives, apparently. 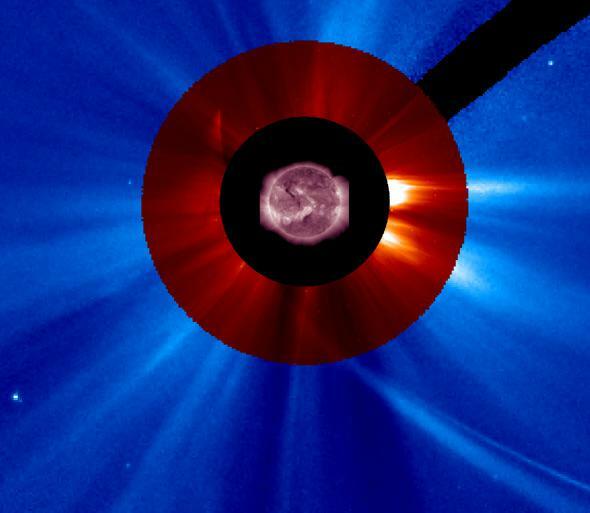 Or a piece of it: This picture from SOHO shows a chunk at least making it around the Sun. Comet ISON, or something resembling it, just after it rounded the Sun. The red and blue fields are from SOHO, and the Sun image from SDO for scale. So comet C/2012 S1 (ISON) has passed the Sun, but not without cost: At some point previous to the rendezvous something happened to the nucleus (the solid part) of the comet, and by the time it made its final approach it clearly was not doing well. The normally compact head of the comet got smeared out, a pretty good sign the nucleus had disintegrated. SOHO’s view from 19:48 UTC, not even an hour earlier than the picture above, showing what’s left of the comet as it came around the Sun. The comet came in from the lower right to the upper left, whipped around the Sun, and has come out from the other side… or something has. As you can see, there is no centrally condensed bit, just more smeared out stuff. That looks like debris to me, or at best a very small and pale reflection of the splendor of what ISON was. Well, as I (and many others) have been saying all along, with a comet like this you just have to wait and see what will happen. It held together a long time, got very bright last night, faded this morning, then apparently fell apart. 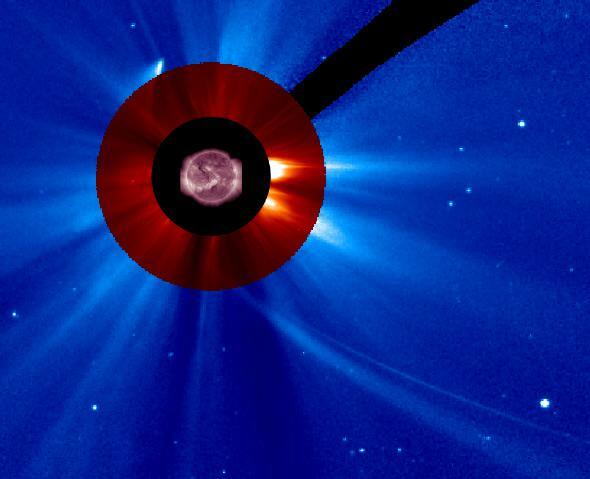 This isn’t surprising; we see comets disintegrate often enough as they round the Sun. ISON’s nucleus was only a couple of kilometers across at best, so it would have suffered under the Sun’s heat more than a bigger comet would have. Still, there’s more observing to do, and of course much data over which to pore. We’ve seen Sun-grazing comets before, and we’ve seen comets coming from the very deepest parts of the solar system before, but we’ve never seen a comet from that part of part of our neighborhood graze the Sun. We’ll learn a lot from this event, I have no doubt. A lot of folks are sad the comet fell apart. I understand that; I never did get a chance to see it myself, and now it looks like I won’t. But the Universe cares not for our desires; it just does what it’s going to do. And there’s lots of science afoot here, so in fact I’m not sad at all; I’m pretty happy. This was an amazing event! And it may be a long, long time before we see the like again. And, of course, Stay Tuned: I’ll keep updating if more news comes in.